With the rapid development of hardware, a stand-alone computer can employ a memory which has large amounts of volumes. Several industries and research institutions have devoted more resources to develop several in-memory databases, which preload the data into memory for further processing. With the boom of in-memory databases, there emerges requirements to evaluate and compare the performance of these systems impartially and objectively. 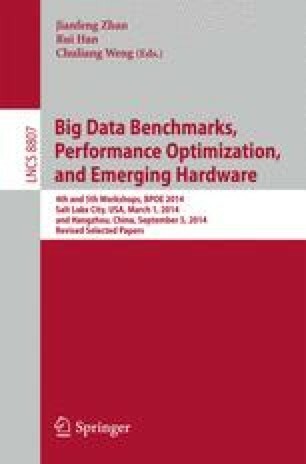 In this paper, we proposed MemTest, a novel benchmark considering the main characteristics of an in-memory database. This benchmark constructs particular metrics, which cover CPU usage, cache miss, compression ratio, minimal memory space and response time of an in-memory database and are also the core of our benchmark. We design a data model based on inter-bank transaction applications, around which a data generator is devised to support the data distributions of uniform and skew. The MemTest workload includes a set of queries and transactions against the metrics and data model. In the end, we illustrate the efficacy of MemTest through implementations on three different in-memory databases. Our research is supported by the 973 program of China (No. 2012CB316203), NSFC (No. 61370101), Shanghai Knowledge Service Platform Project (No. ZF1213), Innovation Program of Shanghai Municipal Education Commission (14ZZ045) and the Natural Science Foundation of Shanghai (14ZR1 412600).